ROKADE Sewage Pumps can handle large quantities of solids thereby achieve dewatering as well as desilting. The pumps are equipped with squirrel cage induction motor of continuous rating having ‘F’ class insulation with bi-metallic switches embedded in stator winding to protect against overheating. Level Control Switches are supplied with the pump for automatic control of liquid level. ROKADE portable Dewatering small / Medium / Big series pumps, light weight, handy and compact, equipped. with an automatic relay switch for motor protection, heavy duty bearings, high efficiency copper epoxy coated wound motor. Direct online Dol start 2 pole induction continues rated motor. 380 volts 415 volts / 440 volts / 460 volts 50 / 60 Hz AC supply. ROKADE portable Dewatering small / Medium / large series pumps, light weight, handy and compact, equipped with an automatic relay switch for motor protection, heavy duty bearings, high efficiency copper epoxy coated wound motor. Direct online Dol start 2 pole induction continues rated motor. 380 volts 415 volts / 440 volts / 460 volts 50 / 60 Hz AC supply. Portable Dewatering small / Medium / Big series pumps, light weight, handy and compact, equipped with an automatic relay switch for motor protection, Heavy duty bearings, high efficiency copper epoxy coated wound motor. Direct online Dol start 2 pole induction continues rated motor 380 volts 415 volts / 440 volts / 460 volts 50 / 60 Hz ac supply. Portable Dewatering medium series pumps equipped with an automatic relay switch for motor protection, light weight, handy and compact, heavy duty bearings, high efficiency copper epoxy coated wound motor. Direct online Dol start 2 pole induction continues rated motor 380 volts 415 volts / 440 volts / 460 volts 50 / 60 Hz ac supply. Portable Dewatering big series pumps equipped with an automatic relay switch for motor protection, handy and compact, heavy duty bearings, high efficiency copper epoxy coated wound motor. Direct online Dol start 2 pole induction continues rated motor 380 volts 415 volts / 440 volts / 460 volts 50 / 60 Hz ac supply. 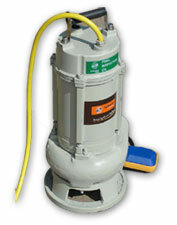 Dewatering Submersible Pumps available in series from 1.5 HP to 50 HP with high discharge head from 2 mtr to 60 mtr. The Pump outer body is completely Stainless Steel 304 with twins tungsten carbide mechanical seal for long life and for rotor shaft SS 431 for better magnetic result. The Pumps are utilized in building construction, steel plant, mines power station and sites etc..
4 / A Wing, Bharat Indl Estate, Off. Lake Road, Opp. Hind Rectifier Co.